With its gorgeous, Santa Fe style details, this handcrafted, Western bed will be a wonderful addition to your home décor. The front of the rectangular, framed headboard has a large, padded panel with a curved top, and the panel is upholstered with rich, brown, patterned, full grain leather. Slightly contrasting, full grain leather embellishes its borders, and the upholstery is double stitched together for extra strength and durability. The leather is accompanied on all sides by intermittently hand tacked, silver finished, hand forged, iron nails. 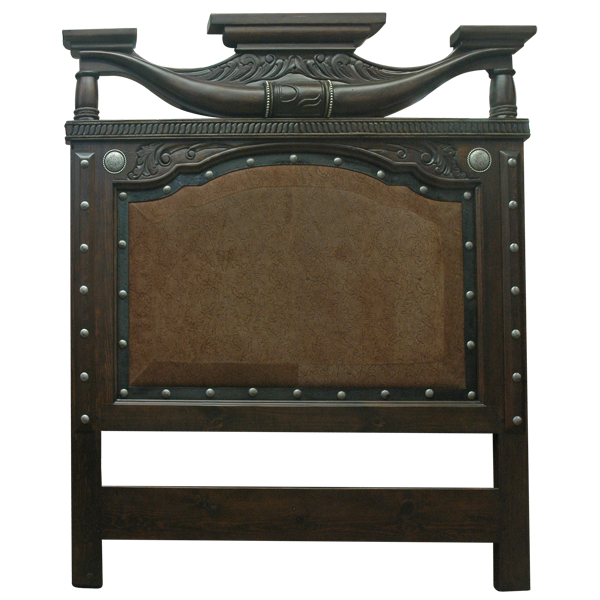 Each top corner above the leather panel is highlighted with a silver finished, hand forged, iron concho. The headboard is adorned with a centered, top, crown molding, and directly below the center molding are marvelous, hand carved, floral designs. Following the floral designs are exquisitely, hand carved horns and a hand carved, twist rope design, and centered in the horns is a hand carved, ranch brand, outlined by gilt nails. The headboard is framed by solid wood uprights, and hand tacked to the face of each upright are silver finished, hand forged, iron nails. The top of each upright is adorned with a small, crown molding. It has a luxurious, dark finish, and the headboard rest on square cut legs. It is made with the best, sustainable, solid wood available, and it is 100% customizable.